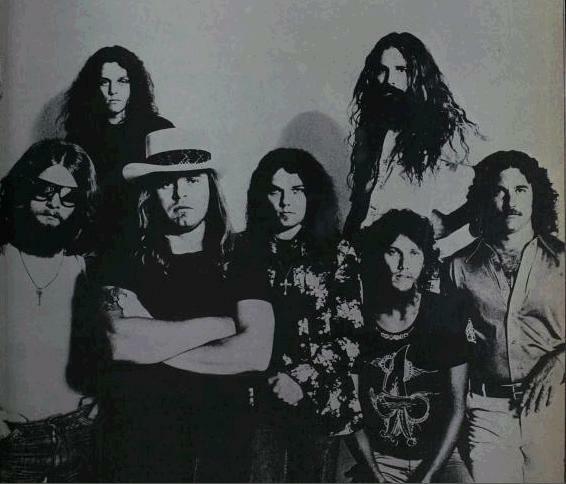 A picture of Lynyrd Skynyrd in the 1970s. If some of you lazy guys had actually tried to grow out your beards and mustaches for Novembeard, our class picture could have looked like this, too! This is the final assignment you’ll have in the course, so congratulations! It’s been nice to get to know all of you. So, for this assignment, choose either Option A or Option B and write your answer in the comments below. This is the only assignment that will have a real deadline: finish this and any other assignments you want to count towards your grade by Wednesday, December 17th. Since we listened to the Lynyrd Skynyrd song “Simple Man” today, think about the lyrics. Have you ever gotten any advice from someone you respected? What did he/she tell you? Use 10 examples of reported speech in your response. If you haven’t gotten advice, you can also just make something up. Just be sure to use reported speech. Talk about job interviews (or another type of interview you’ve had–English class interviews count, too). What kinds of questions did the interviewer ask you, and how did you respond? Use at least 10 examples of reported speech. Again, you can also make up answers and I won’t mind, as long as you use reported speech. So, that’s it. Tell me if you have any questions. See you on Monday! They asked me what my hobbies were and I answered that I liked to read books that could teach me something new, to listen good music, to hang out with my friends, to go to the movies and to take my dog for a walk. They asked me why I wanted to work in a call center and I said that it wasn’t because the money, instead, it was because I wanted to get experience, and to improve my english. Also, I said that it could be a great opportunity to achieve my goals. They asked me to described myself and I said that I loved animals, that I had 2 pets, a dog and a cat, and that I would like to have another cat haha. I said that I liked to make new friends and to know new people. Also, I said that I was in college stuying tourism and I was so happy, because I really liked that career, and that I hoped I finished my studies at the university soon. They asked me where did I live and I said that I lived in Santiago, that I had lived there all my life, but I would like to live in other places like Heredia or San Pedro. I said that I really liked Palmares and Santiago, because I had many friends there and those were quiet places to live, but I wouldn’t like to live there all my life. They asked where did I learn english and I said that last year I took an englis course of INA, that it was the whole year, and then I decided to take another english course of other institution that is called Discovery, and there I improved my english and I was so happy about that. That’s it! Sorry, I don’t remember more questions! -Eliminate the “did” and move the verbs to the past in the last two reported questions. I gonna give some examples about the interview that I had in the English class. They asked me what were my weaknesses and my strengths , so I said that I’m sure that I’m not perfect but I knew the needs for that job, so I couldn’t saw any reason why I couldn’t get up quickly to speed up fast and make an excellent job with my co-workers at the long run. Then they asked me where and how I saw my self in ten years , and I gave an answer like this …. Well I always seen to the future , and try to make the best to catch that future I hope , so I said that I were fine in my future. Other question I remember was really good, and they asked, was how many money I expected form that job, what I answered , just the enough to get paid my priorities. That was a really good experience, and goes better after she Asked me about my phone number ,so… Great for me. Good (and a bit weird, so I can be sure that it was actually you writing it). There were a few problems with verbs–mainly that you should move some of them to the past–but the Office picture made up for it! Hi!! these are the most common examples of questions. He asked me If I had been working or not. I told him that I wasn’t working now. I told him I was absolutely available. He asked me where I had learned to speak the language. I answered that I learned English at Discovery Language academy. He asked me what my hobbies were. I said that I liked to play video games and also that I rode my motorcycle to have some fun and sometimes gardening. He asked me why I wanted to work in a call center. I said that I thought it would be the best way to enrich my English fluency. He asked me What I knew about the company. I said that I knew the company was a multinational company that worked delivering outsourcing and support tech. Excellent. Nothing’s perfect, but that’s pretty close! He asked me that How I see myself in five years from now? I said him that I can see me like a excellent professional. He asked me that What motivates you? I said that I din’t need a motivation. He asked me if I had experience under all kind of situations? He asked me how many differents kind of car I have drove? I said him that I have learned to drive many direrents. He asked me why a wanted worked in their company? I said him that I have had experience in this kind of job. He asked me what I thought about my previous boss? He asked me what my hobbies were? He asked me if I had problem my boss were a woman? I said him that I didn’t have had problem. He asked me if I had learned to talk english? I said him that had been studying english for a long time. He asked me what my salarial prencion was ? I said him that i had accepted a good salary. Pretty good in general. You don’t need to use question marks for reported questions. Also, don’t say “said him.” It should be “told him.” And a few vocabulary words are a bit off (“salarial prencion” isn’t English, for example). The rest of it is clear, though. See you in class!